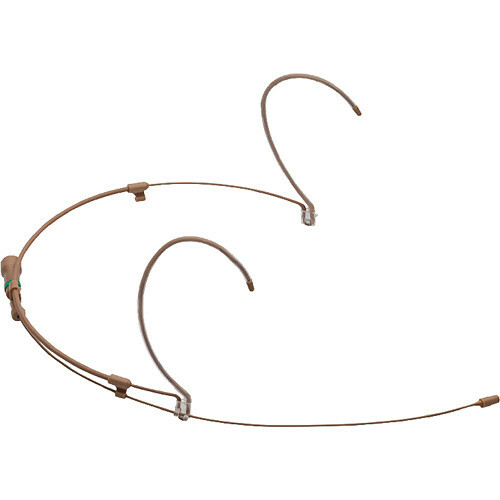 The beige H6 Directional Headset Microphone from Countryman is a low-profile microphone that combines the transparent sounding E6 Earset with a comfortable, lightweight, and adjustable headframe. Weighing less than one-tenth ounce, it can be used for capturing audio and rejecting unwanted sound, feedback, or surrounding noise from stage monitors or nearby speakers in houses of worship, theater, and outdoor vocal and speech applications. The low-profile, directional H6 Headset virtually disappears against the skin, so performers forget they're wearing a mic. Three sensitivity options cover general speaking to extremely powerful vocals, and four color options allow you to match the H6 to your skin tone for minimum visibility. The H6 features a sealed connector with moisture resistance, and protective caps to adjust the frequency response or pattern between cardioid and hypercardioid for maximum isolation and gain before feedback. The H6 Headset is also available as a water- and wind-resistant omnidirectional microphone. This directional H6 Headset microphone is offered without a cable. The cable must be purchased separately to use the microphone.